« Whose marks do you trust? Blackstone’s stake in an oil field off Africa’s west coast has turned into a gusher. They chose a fabulous place to drill. In 2007, Kosmos and other energy companies made one of the biggest oil discoveries of the past decade: the Jubilee field. Kosmos owns 23% of Jubilee, which holds an estimated 1.8 billion barrels of oil. The stake is Kosmos’s only major asset. Now, Blackstone and Warburg have set the stage to reap profits. On January 13, Kosmos announced plans to raise up to $500 million in an IPO. Oil industry analysts believe Kosmos might command a market value of $6 billion to $8 billion. That’s 6 to 8 times the roughly $1 billion that Blackstone and Warburg have pumped into it over the past seven years. 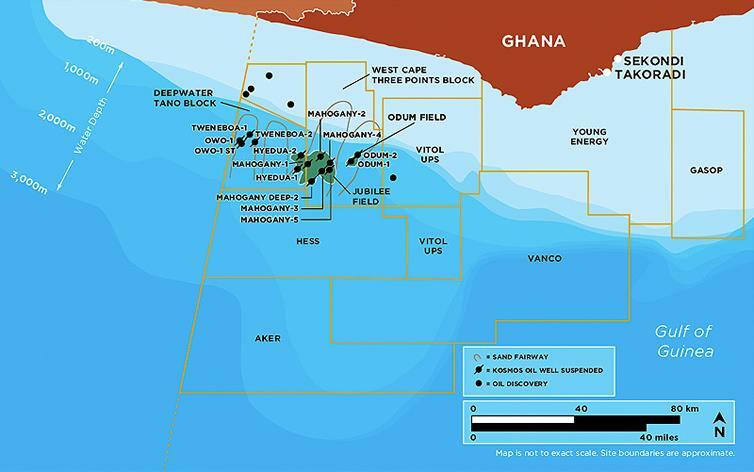 So rich a value would validate their decision to spurn a $5 billion offer for the Jubilee stake late last year from the state-controlled Ghana National Petroleum, which owns 14% of the field. A deal Blackstone and Warburg struck in 2009 to sell the interest to Exxon Mobil for $4.5 billion was blocked by the Ghanese government. Blackstone has made growth investments before — with mixed results. Some of the biggest, including a German cable system build-out and an investment in Sirius, the satellite radio broadcaster, were flops. None has delivered the high-octane returns that Kosmos surely will.